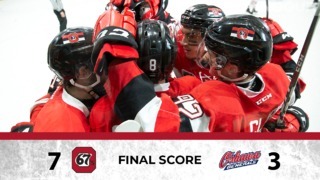 The Ottawa 67’s scored five unanswered goals in the second period on Friday night in a 8-2 win over the Western Conference-leading Sault Ste. Marie Greyhounds. Noel Hoefenmayer and Sam Bitten both scored twice for the visiting Barber Poles, who extended their unbeaten streak in regulation time to 18 games, going 15-0-3 in the process. Jack Quinn gave the OHL’s top team an early lead in the first before the Greyhounds tied things up less than a minute into the second. That was all they would get until late in the game as Ottawa also got goals from Kody Clark and Tye Felhaber in the second, while Matthew Maggio added another in the third. 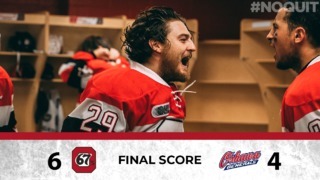 Hoefenmayer (two goals, one assist), Sasha Chmelevski (three assists), Quinn (one goal, two assists) and Clark (one goal, two assists) all had three-point nights for the 67’s. Hoefenmayer’s was a thing of beauty, as the veteran defenceman crashed in goal beat the goalie with a shot from between his legs. 67’s goalie Cedrik Andree turned away 29 of 30 Greyhound shots to improve to 15-2-0 on the season. Barrett Hayton and Jordan Sambrook were the two goalscorers for the Soo. 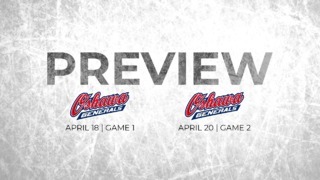 The 67’s close out the weekend road trip in North Bay when they take on the Battalion at 3 p.m. on Sunday.